Travis Meier is the Drum Major of the Marching Mizzou and is a contributing writer to CollegeMarching.com giving band fans a season long look at what it's like to march in their band. At the heart of homecoming is tradition. School spirit maintains the tradition, and the marching band fuels school spirit. The University of Missouri has a reputation for being the first to celebrate homecoming in its entirety like we see today. Here’s a bit on the origin of homecoming, what it means to Marching Mizzou, and what they did this year for their halftime show. Homecoming’s origin story is foggy at best. For years, many people have accepted the University of Missouri as the creators of Homecoming. However, Baylor University, along with a few other schools, has also claimed to be the first. The difference is a matter of years and a definition of tradition. Mizzou invited alumni back to its traditional rivalry game against the University of Kansas in 1911. By then, Marching Mizzou had already been together since its inception in 1885. A full set of events that included the school community, the marching band, the football team and alumni was scheduled. These events would become the modern homecoming traditions that we see today. Baylor claims its first homecoming was held in 1909, complete with a parade and a pep rally including the Golden Wave Marching Band, which was created in 1902. According to a St. Louis Post Dispatch article however, Baylor did not repeat this event until 1915. 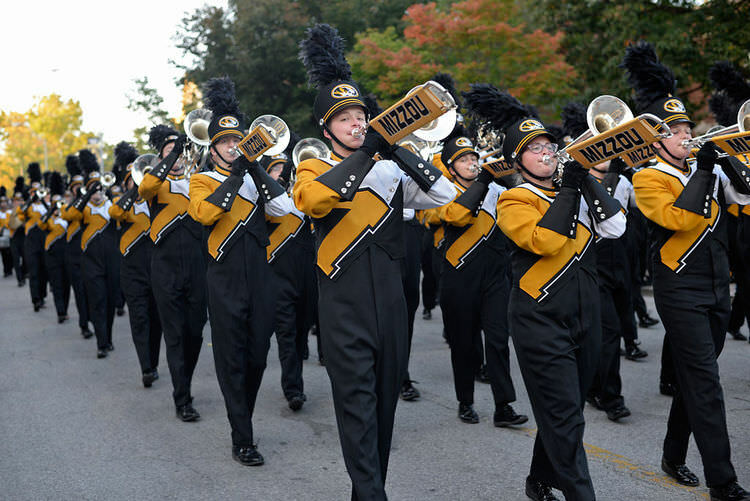 Mizzou’s Homecoming this year was particularly special for Marching Mizzou and its new director, Amy Knopps. Knopps is an alumna who graduated in 2001. The first two years, she played piccolo, and the last two years were spent as a drum major. Fast-forward 16 years, and Knopps was hired by her alma mater as the associate director of bands and director of athletic bands. Some things had changed since she left. She said the dance moves to “Hey Baby” are different than she remembered, and the band had replaced the state of Missouri set in pregame with the SEC logo. She reversed this change. Some traditions never died. Aspects of Marching Mizzou’s pregame like the flip tigers drill and the waltz step remained the same. Similarly with homecoming, traditions like painting the district in downtown Columbia, the parade, the pep rally, royalty and the alumni marching band have been an integral part of the celebration with little change for many years. This year’s theme for Mizzou’s homecoming was “Rhythm of the Roar.” To accent this theme, Marching Mizzou performed “The Rhythm is Gonna Get You,” by Gloria Estefan. Ryan Patterson, a graduate assistant in charge of the drum line, collaborated with fellow graduate student, Juan Calvo, who is from Costa Rica, to create an authentic Latin-based percussion part to compliment the marching arrangement. The total collaboration process of writing and rehearsing took four weeks. When it came time to put the show on the field, 13 additional musicians ranging from students to faculty joined the drum line, totaling 38 percussion members. The piece included a 32-bar percussion break that featured a band dance taught by drum major Jasmine Pool. The dance included moves from Gloria Estefan’s music video as well as the Salsa dance. With the Golden Girls and featured twirlers added on, the performance was an exuberant celebration of a tradition that has lasted 106 years. 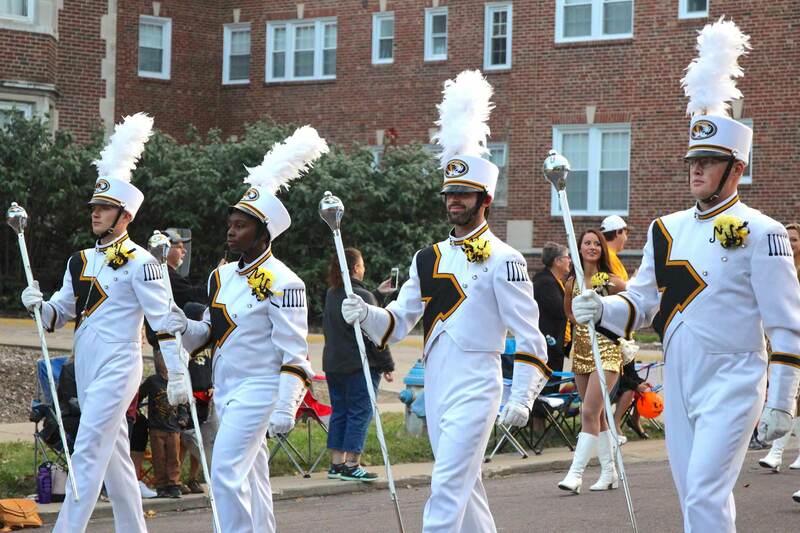 Top Photo: Marching Mizzou drum majors lead the band in the homecoming parade on Oct. 21, 2017. Left to right: Sean Kraus, Jasmine Pool, Travis Meier, Tim O'Sullivan. Bottom photo: Marching Mizzou marches through downtown Columbia, Missouri on Oct. 21, 2017.